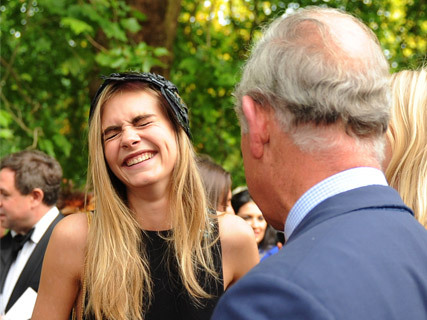 Model of the moment Cara Delevingne had the royal in fits of laughter at the charity event… but how? 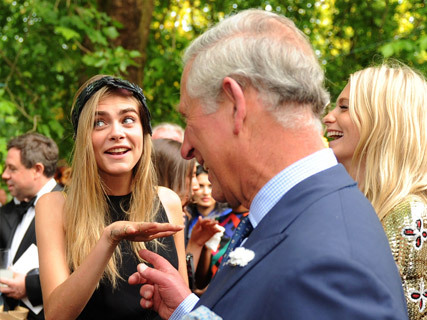 Cara Delevingne may count Rihanna and Rita Ora among her pals, but the model of the moment made her first royal acquaintance last night – Prince Charles. And it seems she went down very well. The British super had the royal in fits of laughter during a chat at a charity event. But what were they talking about?! SEE CARA DELEVINGNE’S NEW TATTOO! Cara Delevingne was just one of many famous faces at charity gathering The Animal Ball, which was hosted by charity The Elephant Family at Lancaster House in London. Dressed in a floor-length Burberry gown, a Saint Laurent by Hedi Slimane bag and fetish inspired mask designed by milliner Leonora Ferguson, the model was joined by her whole family – including mum, dad and sister Poppy – at the event, as well as Jerry Hall, Mario Testino, Amber Aitkin and James Caan, to name but a few. 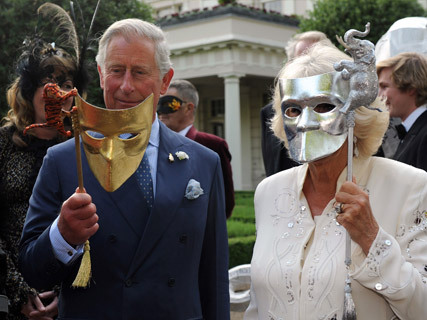 But the real stars of the evening were Prince Charles and the Duchess of Cornwall, who donned their finery – and animal masks! – for the evening out. While Prince Charles wasn’t overly keen on his tiger-themed creation (‘I am slightly anxious about this thing, I can’t see a thing,’ he was overheard saying) being taken to meet Cara Delevingne clearly took his mind off things. The Prince was spotted in fits of laughter after being introduced to the British model, and the pair stood chatting, surrounded by other guests for several minutes. So what made Charles giggle? We’re assuming the answer to that one was a no. Ms Delevingne then went on to tell the Prince that she had another inking – the words ‘Made in England’ – on another part of her body. 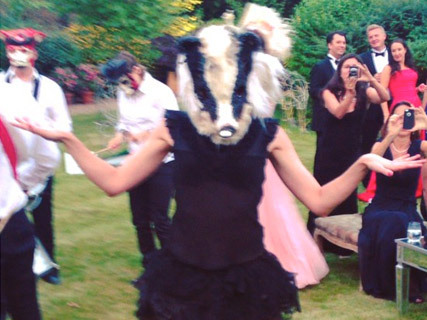 Later in the evening, after guests had taken part in a silent auction, explored an exclusive safari event and nibbled on a ‘lavish feast fit for kings’, Cara Delevingne posted a series of snaps on her tumblr page – including one of a woman dressed as a badger, titled ‘animal dance off’. Last month, party-loving Cara Delevingne enjoyed some down time with A-list pal Rihanna, who was in town for the London leg of her Diamonds world tour. The pop superstar and model-of-the-moment were snapped leaving Boujis nightclub, after watching Rihanna’s brother Rorrey Fenty hit the deck and spin party tunes.